"You might have expected a nice meal in Cheong Wa Dae when you won the event to have dinner with the president. Are you disappointed?" "Not at all. Please call me again next time." 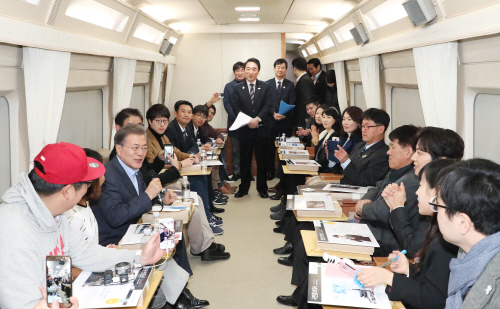 President Moon Jae-in on Tuesday travelled to a venue of the Winter Olympics in Gangneung by KTX express train with ordinary citizens and reporters as part of efforts to promote the Winter Olympic Games. While riding the presidential Train 1 facility, the president had a luncheon with a group of 20 ordinary citizens who won the "Hello PyeongChang" event. 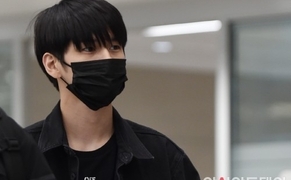 "Hello PyeongChang" is a campaign site opened last month by the PyeongChang Organizing Committee for the 2018 Olympic & Paralympic Winter Games (POCOG) to promote the Winter Olympics. President Moon sought to promote the upcoming Winter Olympics by posting a picture of PyeongChang Olympics ticket on his Facebook page to participate in the "Hello PyeongChang" event which took place on November 26. The Seoul-Gangneung KTX line will officially open on Dec. 22. The new line will take only 1 hour and 26 minutes to travel from Cheongnyangni to Gangneung and 1 hour and 54 minutes from Seoul Station to Gangneung. This is the first that ordinary citizens and reporters have ridden a presidential train since it was introduced in 1979. It's also the first time that a private presidential space of a train has been revealed to public. The test drive was attended by 20 citizens who won the event, Transport Minister Kim Hyun-mi, Culture Minister Do Jong-hwan, PyeongChang 2018 President Lee Hee-beom, PyeongChang Paralympics ambassador Jung Yong-hwa, short track speed skater Byun Chun-sa, 37 sports news editors from Korea Sports Press Union, and 48 reporters from Korea Policy Press Corps. During the luncheon with citizens, Moon said, "You are the first passengers who are riding this train with the President before the official opening. I believe it's more valuable and precious to have a meal with the president here rather than getting a big meal at the Blue House." "We are soundly preparing for the PyeongChang Winter Olympic Games, and the necessary transportation infrastructure for the event will be completely finished this year, including the opening of the Seoul-Gangneung KTX line. From now on, efforts to promote and boom the event are important. Thanks to you, I'm confident the PyeongChang Winter Olympic Games and Paralympic Games will be a festival for all people," Moon said.